T.V. Williams, the late President of Liverpool Football Club, is famously remembered as the man who courted and wooed Bill Shankly across the Penines and into Anfield in 1959. What is less generally well appreciated is that 'TV' had also played a decisive role just five years earlier in the cajoling of an initially reluctant Bob Paisley into throwing his lot in with the club as a member of the backroom staff. At the end of the 1953-54 season Liverpool were disastrously relegated from top flight football and Bob Paisley's career had to come an end. Deep down however, he harboured ambitions as a physiotherapist. He had studied a correspondence course in the subject and with help from Williams and his friend John Moores had been able to visit local hospitals to sit in on operations and observe medical practices. T.V. Williams was delighted to offer Paisley the job of reserve team manager. 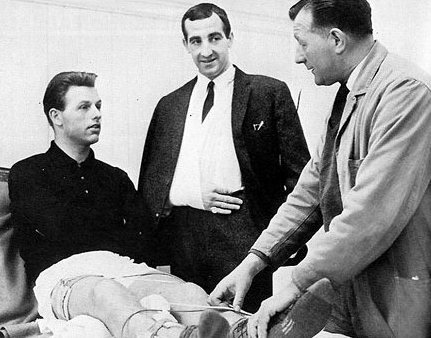 "I was always interested in physiotherapy when I was a player. I took a correspondence course for two years before I hung my boots up. Then Sir John fixed me up with a full-time course. It meant going to Belmont Road hospital from nine to five every day. It was all changing then from what it had been through most of my playing days. Then it was the hot and cold water treatment. Trainers had to have hands like leather. There was hardly a player who got by without suffering first degree burns at some time or other. You put the hot towel on and then the cold one, it was the main treatment. The first person I ever treated was Albert Shelley, our first-team trainer, for a boil on his backside. Albert was one of the old school. He taught me how to harden my hands with the towels. When the physio machines came in I had to show him how to use them, but he never really came to terms with them. He had a common-sense approach to the practical side of it, but he was frightened by the electrical stuff, he even used to put a handkerchief on the leads. So when the machines came in I virtually took over the treatment of all the players." Don Welsh was first team manager and continued to struggle as Liverpool adjusted to life in Division 2. The club suffered its worst ever defeat, 9-1 at Birmingham, on their way to an 11th place finish, the lowest in the club's history. Meanwhile, after finding his feet in his new role, Bob Paisley's reserves began to make pleasing headway. In his second term at the helm Paisley guided the reserves to runners-up spot in the Central League, second only to the brilliant 'Busby Babes' of Manchester United. The following season they were to take the title for the first time in the club's history. 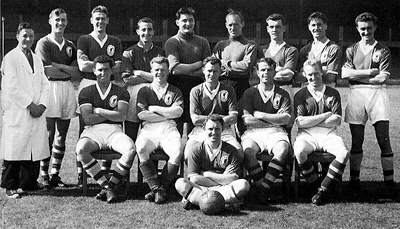 Welsh had begun to turn around the fortunes of the senior players too after their ropey introduction to life at the lower levels, steering the club to 3rd place in 1955-56 and missing promotion by a whisker. It was too little too late however, and he became the first manager ever to be sacked by Liverpool. "At their weekly board meeting last night Liverpool FC directors appointed Phil Taylor as manager. Hitherto he has been acting manager only. While Mr Taylor has been acting manager, the club did not fill the coaching position which he formerly occupied. They have now appointed Bob Paisley, at present second-team trainer, as chief coach. He will take up the duties when the players report from training next season. There was a big difference in the the styles of play of Phil Taylor and Bob Paisley; the one stylish and thoughtful; the other rugged and determined. If they work in double harness in such a way as to bring the best out of the player in the same directions Liverpool should benefit considerably. Here's wishing them both best of luck." A series of near miss promotion attempts ensued as the 1950s turned into a totally frustrating decade for the Reds. In 1957 the club again finished 3rd and the following year it was 4th even though the points total was greater. Season 1958-59 began badly with four defeats in the opening five games. A humiliating 5-0 thrashing at the hands of Bill Shankly's Huddersfield quickly followed but the tide soon turned. A winning streak of 14 victories in 16 games saw the team leap up the table and begin to look like promotion prospects once again but the momentum was well and truly crushed by one of the most catastrophic defeats in the club's history. Liverpool went out of the FA Cup at the hands of non-league Worcester City courtesy of a 2-1 scoreline. The league season was to end limply with another disappointing 4th place. "My uncle was a slaughterman for the Co-op and I used to get pigs' bladders off him to use as footballs in the street."